A community meeting was held Monday to discuss a pilot program involving cameras and fencing along a stretch of Caltrain tracks in Palo Alto as part of an effort to prevent future deaths. The meeting was held at the Mitchell Park Community Center's El Palo Alto Room. The three-camera system has thermal infrared technology that senses whether a person, animal or object is down the corridor for about a mile, city spokeswoman Claudia Keith said. 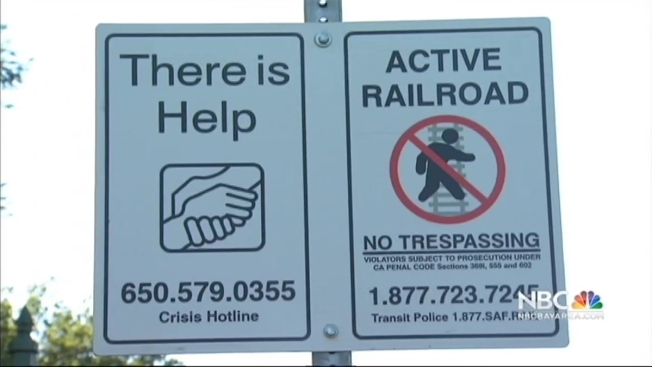 If the program detects a person on the tracks, it will send a 911 call to Palo Alto police, Keith said. The system will be placed at the Meadow Avenue crossing near Alma Street, between the California Avenue and San Antonio stations, she said. The 60-day pilot program will start in a few weeks and if the city decides to make the system permanent, it will cost $172,000 to install, she said. The thermal infrared technology has been used during large sporting events, but is being used for the first time along railroad tracks, Keith said. Over the next few weeks the city is also working with Caltrain to install 8-foot-tall welded wire fences on the east train corridor for about 4 miles from San Francisquito Creek to Oregon Expressway, she said. Caltrain is covering the costs for the work, which are around $420,000, she said. fences at the request of the city to make it difficult for people to climb the fences, Keith said. The city is paying about $100,000 to have the winglets installed, Keith said. Starting in August, vegetation will be removed along the corridor to make way for the fences, which will cost the city $168,000, according to Keith. The vegetation is expected to be cleared by mid- to late September, she said. One of the speakers at this evening's meeting is Dr. Shashank Joshi of Stanford University who is part of the city's Project Safety Net, an organization focused on youth support services and preventing teen suicides, Keith said. City Manager Jim Keene, landscape architect Peter Jensen and Office of Emergency Services director Ken Dueker and other city officials are also expected to speak at the meeting. "We are in the middle of another suicide cluster, we had one in 2009 and there's some feeling we're back in that pattern again," Keith said. In 2009, there were four students from the city's Gunn High School who committed suicide on tracks in a six-month period. Between January and March of this year three people were hit by a Caltrain, and two of those incidents turned fatal, according to Caltrain officials. One of the two people killed was a 15-year-old Palo Alto High School student and the case was determined to be a suicide, Caltrain officials said. "As a city we feel that sense of urgency to do whatever we can and that's why we really wanted to move forward really quickly," Keith said.